Onopordum thistles were probably introduced from Europe in the early 1800s as ornamental plants. 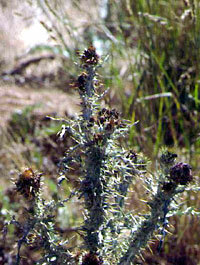 By 1850, Scotch thistle was recorded as a weed in Victoria and today both species are serious pasture weeds in South Eastern Australia. The plants form dense stands, smothering desirable vegetation with their rosette leaves, thus reducing pasture stocking rates. Plants may produce up to 20,000 seeds, a proportion of which become incorporated in a long-lived soil seed bank and remain viable for more than twenty years. A fifteen year project on these thistles resulted in the release and redistribution of a seed-head weevil, Larinus latus (1992), a stem-boring weevil, Lixus cardui (1993), a crown weevil, Trichosirocalus briesei, (1997) and a petiole moth, Eublemma amoena (1998). The seed and stem-boring weevils are now widespread and together have reduced seed rain at several sites in NSW by more than 90%. A crown fly, Botanophila spinosa, and the seed gall-fly, Urophora terebrans, were released in 2000 but have not yet established and further releases are planned. Both the moth and the crown weevil are expected to contribute damage and have been included in the national redistribution program.